IP65 Waterproof can withstand all kinds of weather including heavy rain and snow. Solar Energy: Built-In 600MA AA NI-MH Battery, In the plenty of sunshine charge 4-6 hours can work 8-10 hours. even cloudy day can also recharge, very environmental protection and energy saving. Easy Operation: Quite easy to set up, 2 switches control all operations-turn it on/off and select your favorite mode between. 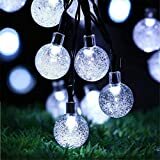 Applicable Place: These led bubble globe lights glow soft warm light, adding romantic atmosphere to your gazebo, deck, home, patio, lawn, garden, porch, fence and anywhere you apply them. 5. With 2 switch, one is Mode (Flashing mode convert switch), another is Power On/Off (After switch turned on, can automatic light control and charging).